UMH160R is a powerful and cost-effective broadcast level receiver/decoder. 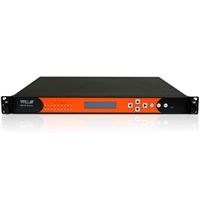 It supports MPEG-2/H.264 SD/HD signal receiving through various inputs, and then decrypt and covert the processed programs/transport steams through a rich set of outputs including CVBS, HDMI, SD/HD SDI, ASI, TS/IP and QAM/OFDM. It supports multi-channel descrambling, multiplexing, transcoding and transmodulating. It also supports video decoding with two audio channels. With the web-based management interfaces, it is ideal to support advanced content distribution, real-time signal conversion and transmission via an all IP headend system. UMH160R supports to receive all kinds of digital television signal in the world (DVB, ISDB-T and ATSC), and then helps to distribute the signal in a way that operators prefer through its various outputs interface. No matter it is for traditional transmission in a HFC network, or in a all IP-based network, UMH160R can all best fit for the needs of high quality and cost-effective video distribution. Receiving, decoding, descrambling, transmodulation and transcoding all can be achieved in a single 1RU chassis. For small to medium size application, probably UMH160R can handle almost all the system processing, offering best value solution to operators. The trend to HD and H.264 content distribution creates business continuity issue. In combination with the MPEG-2/H.264 mutual transcoding function, UMH160R helps operator to complete the content receiving in accordance with the latest digital standard, and then distribute through legacy equipments and network in a more flexible and efficient way. Offer 2 pairs of audio decoding in either digital or analogue format in order to meet the demand of multi-languages application. UMH160R is suitable for the operators who requires multi-audio supporting. The UMH160R can support OTA operation (optional), and allow operator to manage, configure and monitor the IRD remotely with less manual work. It makes UMH160R a top and cost-effective choice for operators who are in need of remote management. 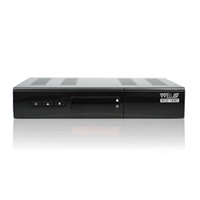 UMH160 is Wellav’s standard DVB MPEG-2/H.264 receiver decoder. It can receives MPEG-2 and H.264 signals in DVB-S/S2, DVB-C/T, ASI and TS/IP format and convert signals to CVBS,HDMI, HD/SD-SDI, ASI and TS/IP. It also supports multi-channel DVB decryption and BISS descrambling. With web-based network management interface, it is an ideal equipment for large scale content contribution and distribution. 2)	Decrypt multi-channel programs via two common interface slots, which support descrambling of CAS such as Conax, Irdeto, Viacess, NDS, Verimatrix/Comvenient, CTI and etc. With a flexible modular design, SMP180 can receive and process digital programs from up to 12 DVB-S2 transponders or 12 QAM-RF frequencies. With a different set up, SMP180 can support program decryption via four multi-channel CAM modules with commonly adopted CAS in the market. With ASI and IP interfaces for input and output, SMP180 can be integrated into any headend systems for content delivery and re-distribution. 2)	Independent ASI and IP output for different applications. With improved stability and multiple new features, These receivers provides more options for operators to customize for their unique environments.